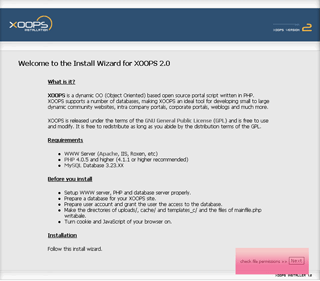 XOOPS is a dynamic OO (Object Oriented) -based open-source portal script written in PHP. XOOPS is the ideal tool for developing dynamic community websites, intra-company portals, corporate portals, weblogs and much more in size from large to small. 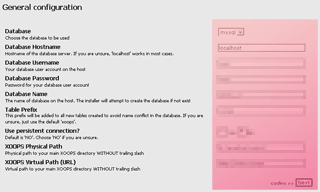 To setup a XOOPS website, the easist way is to install a RaidenHTTPD (PHP4 or PHP5 version) first, and You also need to have a MySQL 4 or MySQL 5 server installed. After You set these 2 things up, You are ready to install XOOPS. We recommend you to download the ZIP package version. For example, if your web document root directory is c:\inetpub, make a sub-directory called xoops under c:\inetpub so it will look like c:\inetpub\xoops. Next, extract the zip file you just downloaded to that folder. [ready] web server: The latest version of RaidenHTTPD. [ready] php processor: The php processor is included in the latest version of RaidenHTTPD. and you should see this screen. Click next to continue. Click next. You must correctly input information for all the fields as necessary (For example: database: mysql; database hostname: localhost; username: root; password: ; database name: xoops (user must have create db permission)). Click next. Confirm your information here. Click next. Remember your site url carefully here. Click next. 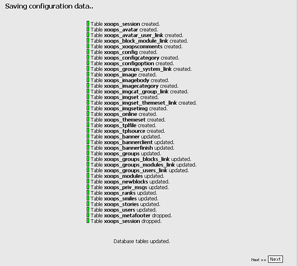 Confirming database existence. Click next. Here is the important part. You need to choose your admin login/pass. Click next. When you are done, you can visit your own xoops portal site.